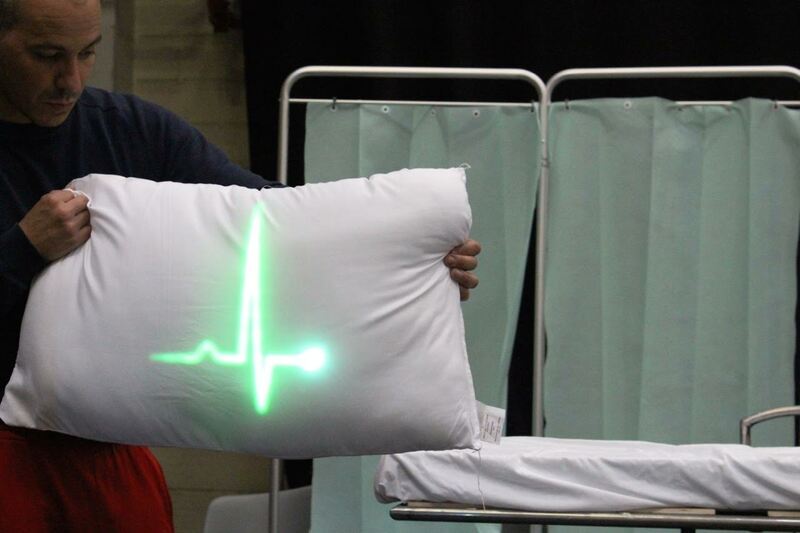 Kat Joyce, co-artistic director of physical theatre ensemble Tangled Feet, on the company's new production about the NHS - and why care doesn't show up in a spreadsheet. Darwin’s law of natural selection, the so-called ‘survival of the fittest’, is often misinterpreted, particularly by the capitalist system, to mean ‘survival of the best competitor’. But an equally valid interpretation is ‘survival of the best nurtured’. In our society, however, the work of caring is frequently not valued – at least not economically. The importance of ‘care’ in our society, and the often-unheard stories of the people doing the caring, have been at the heart of Tangled Feet’s work in 2015. In January we made Need a Little Help, a show for 3-7yr olds exploring the world of young carers, inspired by the young people we’ve worked with in recent years who carry the responsibility of caring for a parent or sibling. In that production (a co-production with Half Moon Theatre) we experienced the beautiful phenomenon of even the smallest children in the audience bursting with a desire to reach out and help our protagonist, Ella, as she struggles to juggle her caring responsibilities with a desire to play. In Kicking and Screaming, which toured the North East in March, we continued a strand of investigation that we began with Push looking at what it’s like caring for a small baby. No-one wants to admit that they are struggling – or worse, failing – as a parent, but many wrestle with these concerns all the time, while simultaneously trying to present a veneer of having it all under control. As we step back inside theatre auditoriums (after a spell of making work in public spaces) it seemed fitting to focus our attention on the close-up, intimate acts of caring and being cared for that happen in both our homes and our hospitals. Over the past two years, as we’ve developed our show ‘Care’ (on at Watford Palace 21-28 June), Tangled Feet have been researching the NHS and the strains it is under. Over this period, the Health and Social Care Act 2012, which opens up the NHS to private interests and introduces a healthcare marketplace, has really started to take effect. Whilst most people agree that the NHS needs to evolve to absorb the challenge of an ageing population, the near-universal consensus from health care professionals seems to be that opening up the NHS to competition is a complicated, costly business. It’s a process that risks private providers cherry-picking the most cheap-to-deliver parts of the service, leaving a fragmented NHS to treat the most expensive and complicated health problems. The other unanimous sentiment is that the commitment and dedication of an NHS workforce who often go far beyond the call of duty is currently the glue that holds the whole thing together. Care, and the act of caring, is impossible to quantify or value. True ‘care’ doesn’t show up in a budget or a spreadsheet – only in the live demonstration. It’s the nurse who stays behind after their shift has finished to hold the hand of a dying patient. It’s the GP who takes the time to gently explain a difficult diagnosis. It’s the consultant who stays in a post to hold a team together, despite the fact they’d earn double on Harley Street. True care is experienced in millions of tiny gestures, in the touch or the tone of voice, in the stress absorbed to spare another, day after day, year after year. It’s this very live, human, physical, intangible aspect that Tangled Feet wanted to put at the centre of Care. Much has been written and spoken about the marketisation of the NHS; it’s an intensely complicated political subject which has been passionately and intelligently argued (recently, for example, in the Royal Court’s verbatim piece Who Cares: read Exeunt’s review here). But as physical theatre-makers the approach we have chosen to take has been to foreground the vulnerability of the human body, rather than the verbal arguments. Because our strongest appreciation – and scrutiny – of the NHS comes when we are in its care, we’ve cast our audience as patients in the production at Watford Palace Theatre. They inhabit a large waiting room with action happening around them – screens and gurneys whizzing past – as well as above them on a specially designed aerial rig. Over the last few years making outdoor aerial work, we’ve come to appreciate how brilliantly aerial work and performance at height can draw attention to the fragility of the human body. Watching someone writhing in a harness, or dangling from a hoop, our mirror neurones kick into gear and we cast ourselves in their shoes. Our stomach lurches if we fear they will fall. It’s a really visceral connection with another human being. Both patients and clinicians end up in the air in ‘Care’, their feet swept off the ground as we attempt to explore an NHS which is truly in limbo. We’ve also found ourselves plundering the visual and physical language of action and disaster movies in our depiction of the fight currently underway. What is the prognosis of our beloved NHS? Is it terminally infected with profit motives? Or will the dedication of its staff – the NHS’s immune system – enable it to withstand? We cannot know. We are currently, in the final week of rehearsals, having daily passionate arguments about the ending of our show; the final notes, what we leave the audience with, as we try to balance our enormous hopes and our enormous fears for our beloved NHS. As artists, it’s not our job to make statements but to open apertures for people to do their own thinking and interrogating. ‘Care’ is, we hope, an opportunity for people to come into a space, step outside their busy lives and contemplate our health service and the people who work in it, for a while. Just as we never truly appreciate feeling well until we fall ill, perhaps we are, as a population, unable to appreciate the marvels of a free healthcare system until it quietly slips away. As an ensemble, caring relationships are right at the heart of Tangled Feet. We know that the ‘value’ in our company comes from the trust, investment, excitement and commitment of the people who spend time working on, watching or taking part in our projects. The ‘creative industries’ can often feel quite cut-throat, with individual artists lauded or discarded on the basis of their current hype level. But as an ensemble committed to a long-term artistic journey together, we are invested not only in each other’s creative development but also in each other’s wellbeing. We try really hard to create a working situation together which enables and inspires people to deliver their best performance, but also accommodates them when they are not on top form or need some flexibility – when they have just had a baby, or are recovering from injury, or a bereavement. This may not necessarily make us the ‘best competitor’, and it certainly doesn’t help us drive a profit. But sharing these joys and sorrows together – being part of something that we nurture and that we hope also nurtures others – makes the work, and our experience of it, infinitely richer. Care runs at Watford Palace Theatre from 20th- 28th June. Tickets here. £10 tickets available for NHS workers: quote NHS at box office.